Welcome to the official site about Cholinergic Urticaria. On this site, you can find a treasure of useful information regarding a physical type of hives known as Cholinergic Urticaria. You can read an overview of this condition, common medical treatment options, symptoms, causes, view pictures, talk to others with this condition on a live forum, and much more. If you get what feels like a “heat rash,” or an itchy feeling when you exercise, eat spicy foods, transition into warmer rooms, or other activities that cause sweat or an increase in body temperature, you may want to talk to a doctor to find out if you have cholinergic urticaria (also called heat hives). “Cholinergic” means “related to acetylcholine.” Acetylcholine is a chemical used in the parasympathic nervous system. It acts as a neurotransmitter. Acetylcholine seems to be involved in cholinergic urticaria reactions. It appears that when acetylcholine is released at the nerve endings in the skin, it initiates a hives response. “Urticaria” (the medical term for hives) originates from the Latin word urtica, which means “stinging nettle.” A stinging nettle is the name of a plant that has small hair-like needles that sting if touched by humans. In urticaria, histamine is released which produces a very prickly and itchy feeling in the skin. Cholinergic Urticaria is a medical term used to describe a subcategory of physical urticaria (hives). It is characterized by a hypersensitive response in the skin as a result of the body increasing in temperature (passively or actively), or the precipitating release of sweat. Individuals with this physical heat hives condition often ask, “Why do I itch when I get hot or exercise?” This is the most common symptom experienced by sufferers. Are you suffering with cholinergic urticaria, or do you know someone who is suffering with it? 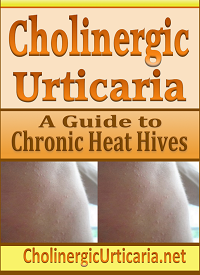 You may be interested in the book: Cholinergic Urticaria: A Guide to Chronic Heat Hives. This book was written by B. Page, the author and owner of this website. This book contains an overview of cholinergic urticaria, common treatments, and Ben shares all of his tips of how he was able to overcome his cholinergic urticaria. The book is available at most major online book retailers, including Amazon.com, BarnesandNoble.com, and more. At this time, scientists and researchers do not know why cholinergic urticaria (heat hives) develops, or the exact causes. Some research has indicated it could be an autoimmune condition to one’s own sweat or sweat serum. Other studies, however, have suggested a possible allergic component, blood disorder, or other unknown cause. No studies or research thus far has been conclusive, and more research is needed to understand the exact causes and mechanisms involved in a reaction and acquisition of this disease. While the initial cause is unknown, doctors do know that cholinergic urticaria reactions are caused by a break down of the mast cells in the skin prior to sweat release, or after an increase in body temperature due to passive or active body warming. This is thought to be caused by the release of acetylcholine, which somehow triggers an allergic response in the skin. Continue reading to learn more about cholinergic urticaria causes. Individuals with Cholinergic Urticaria often have no symptoms at all when they are not being exposed to a heat stimulus or increase in body temperature. Individuals can function normally and appear to be healthy. They only begin to exhibit symptoms when they are exposed to the heat stimulus (either passive or active). When an individual is exposed to a heat stimulus (typically in the form of physical exertion, high room temperature, or emotional responses), then the person may begin to feel a stinging or itching feeling on the body. This may be randomly spread throughout the body, or it may begin in a localized area (such as the wrists, face, chest, legs, back, etc.). Small pinpoint hives, which often disappear within minutes or a few hours once the reaction has resolved. These are sometimes called “heat rash,” but it differs from a more common type of “heat rash” known as Miliaria Rubra, which is caused by blocked sweat pores. Also, miliaria rubra typically resolves within only a few weeks, whereas cholinergic urticaria can be long lasting. General Anhidrosis, or reduced sweating ability. It is often hard for those with cholinergic urticaria to sweat. When sweat does come out, reactions often subside or decrease in intensity. Learn more about Cholinergic Urticaria Symptoms. What does cholinergic urticaria look like? Like many diseases, cholinergic urticaria may have a slightly different appearance for each person. In more severe cases, hundreds of pinpoint hives can cover the body area affected. The palms and soles of the feet are often spared, but any other part of the body can be affected, or even the entire body. As you can see in this picture to the left, a severe case of cholinergic urticaria can leave hundreds of very small pinpoint hives all over the skin. Sometimes flushing (redness) and small wheals (welts) may also occur. In minor cases, hives may not be visible during the reaction, and the individual may only experience minor flushing, along with the stinging and itching sensation. These physical signs and symptoms often disappear within minutes or hours after the reaction and do not generally appear on the skin unless the person becomes heated and experiences a reaction. See more cholinergic urticaria pictures, and see examples of flushing, hives, wheals, and more. There is no cure for Cholinergic urticaria, and treatment options are often limited. Some common treatments include taking antihistamines (such a Allegra, Zyrtec, or stronger ones), avoiding known triggers (such as hot weather, physical activity, and spicy foods), corticosteroids (only for extreme cases), anabolic steroids, UVB therapy, sweat/exercise therapy, diet changes (such as avoiding known trigger foods), and more. To view a more comprehensive list, visit our cholinergic urticaria treatment page. Cholinergic urticaria often changes, much like season allergies or other allergic conditions. Individuals may experience periods of heightened sensitivity, as well as periods of almost no reactions or very low sensitivity. This can sometimes be affected by seasonal weather, as well as other unknown factors. This condition may last for months, years, or may even go away and come back sporadically throughout one’s live. In one study, the average duration was approximately 7 years, although some people had this condition (on and off) for up to 30 years. Even though this condition may be long-lasting and highly variable, individuals suffering with this can often find treatment regimens that enable them to live a relatively high quality of life and go on to work, go to school, and engage in other activities. This is not considered a terminal disease, and it is not known to shorten life span, cause early death, or any other immediate dangers. The only exception is that in rare cases, people with a severe case of cholinergic urticaria may experience anaphylactic shock (severe swelling), which could be life threatening. This is very rare, and if this happens, please call a doctor or hospital immediately. If you hate reading and would prefer to watch a video summary of the content of this site, you can check out the cholinergic urticaria video archive page. These videos are available on YouTube. They cover the basic information about cholinergic urticaria, including symptoms, treatment options, common questions, and more. If you have this type of hives, I would urge you to consider joining the cholinergic urticaria forum, where you can talk to others, share your experiences, and enjoy the company of an entire community who suffers with this exact type of hives. It can be very comforting knowing that others are experiencing exactly what you are going through. This is the top website on cholinergic urticaria on the web, and one of the only websites dedicated exclusively to this condition. This site always has an “open door” policy, and would always welcome any researchers, scientists, RN nurses, or doctors to engage on the forum, ask any questions, relay any useful information, or anything at all. If anyone has any beneficial stories, research, or medical experiences that can benefit the individuals suffering with this, please let us know. Since this is one of the largest forums and websites dedicated to this, it would be a great place to get study participants, or ask any specific questions you may have about this condition.